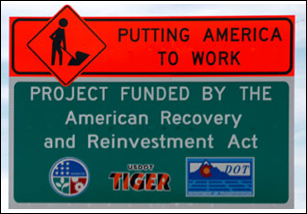 As the midterm election season approaches, new road signs are popping up everywhere – millions of dollars worth of signs touting "The American Reinvestment and Recovery Act" and reminding passers-by that the program is "Putting America Back to Work." On the road leading to Dulles Airport outside Washington, DC there's a 10' x 11' road sign touting a runway improvement project funded by the federal stimulus. The project cost nearly $15 million and has created 17 jobs, according to recovery.gov. 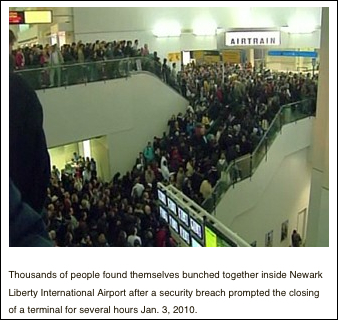 However, there's another number that caught the eye of ABC News: $10,000. That's how much money the Washington Airports Authority tells ABC News it spent to make and install the sign – a single sign – announcing that the project is "Funded by The American Reinvestment and Recovery Act" and is "Putting America Back to Work." The money for the sign was taken out of the budget for the runway improvement project. ABC News has reached out to a number of states about spending on stimulus signs and learned the state of Illinois has spent $650,000 on about 950 signs and Pennsylvania has spent $157,000 on 70 signs. Jill Zuckman of the Department of Transportation said, "The best estimate is that states have spent about $5 million of the $28 billion spent on road projects on signs. Congressman Aaron Schock (R-IL) has joined the chorus of Republican outrage over stimulus signs and claims at least $20 million has been spent on them. He told ABC News, "I think it's a bit of an oxymoron to spend tens of millions of dollars of taxpayer money, borrowed money, on a bunch of signs to tell them how we are spending their taxpayer money." iTunes is currently playing: Give It Away from the album Also Known As Mary by Quincy Coleman. I [heart] Apple to death! You know how sometimes, when you find yourself surrounding by rude obnoxious people gabbing on cell phones, you wish the damn things had never been invented? Well, watch this iPhone commercial and think about it the next time the guy sitting behind you on the train takes out his cell phone and you want to smack him. Directed by Sam Mendes. "When You're Smiling" sung by Louis Armstrong. Apple, you rock! iTunes is currently playing: I Love To See You Smile by Randy Newman. iTunes is currently playing: Rest For The Weary from the album The Rainy Season by Marc Cohn. 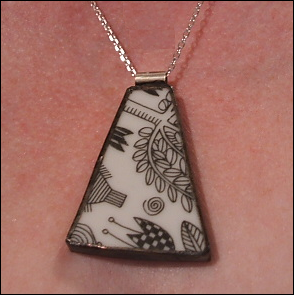 Juliet Ames (The Broken Plate Pendant Company) makes pendants, earrings, cufflinks, and other cool stuff out of -- you guessed it -- broken plates. Visit her web site or her Etsy shop. 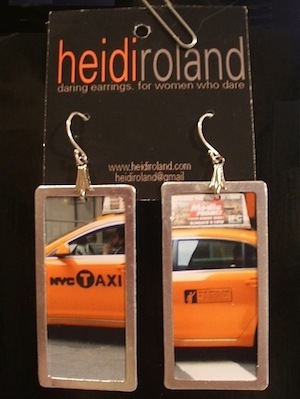 Heidi Roland creates "daring earrings for women who dare" ... dare to wear photos on their ears, I guess. She creates earrings from her own original photos as well as from feathers, shells, metals, and other materials. The earrings show actually contain 4 sections of the same photo. (Sections 1 and 4 are on the back.) You can see more of her pieces at her Etsy shop. iTunes is currently playing: I Feel Pretty from the album West Side Story- Original Broadway Cast by Carol Lawrence and Marilyn Cooper. 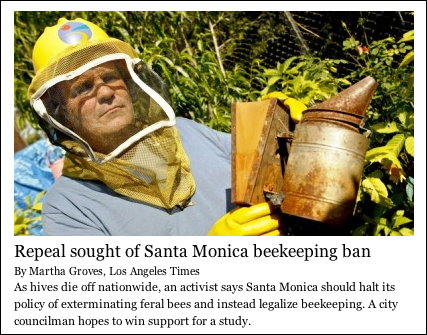 ... would people be upset that the government wants to kill feral bees. iTunes is currently playing: Honey For The Bees from the album Alf by Alison Moyet. And watch me make the earth move! 'Many women who do not dress modestly ... lead young men astray, corrupt their chastity and spread adultery in society, which (consequently) increases earthquakes,' Hojatoleslam Kazem Sedighi was quoted as saying by Iranian media. Women in the Islamic Republic are required by law to cover from head to toe, but many, especially the young, ignore some of the more strict codes and wear tight coats and scarves pulled back that show much of the hair. Iran is one of the world's most earthquake-prone countries, and the cleric's unusual explanation for why the earth shakes follows a prediction by President Mahmoud Ahmadinejad that a quake is certain to hit Tehran and that many of its 12 million inhabitants should relocate. Seismologists have warned for at least two decades that it is likely the sprawling capital will be struck by a catastrophic quake in the near future. Some experts have even suggested Iran should move its capital to a less seismically active location. Tehran straddles scores of fault lines, including one more than 50 miles (80 kilometres) long, though it has not suffered a major quake since 1830.
iTunes is currently playing: I Feel The Earth Move from the album Tapestry by Carole King. ... to connect with women who need to lose a few pounds? iTunes is currently playing: More Today Than Yesterday from the album More Today Than Yesterday by Spiral Starecase. Japanese version of PCmover from Laplink (formerly known as MoveMe from Spearit Software). Above: front of box. Below: back of box. iTunes is currently playing: Move It On Over from the album 20 of Hank Williams' Greatest Hits by Hank Williams. 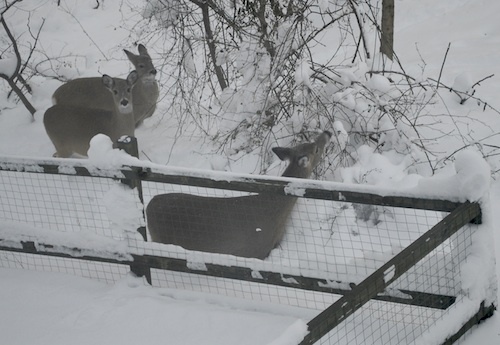 It's hard to find deer food under a foot and a half of snow! iTunes is currently playing: Dig Down Deep from the album Marc Cohn by Marc Cohn. 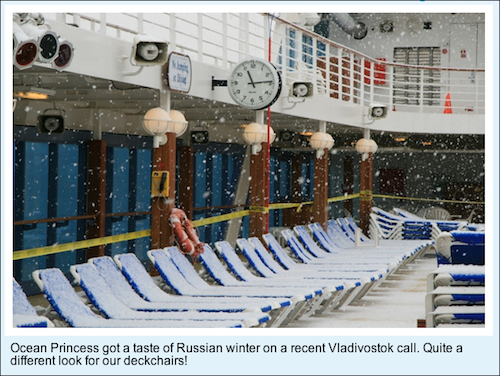 Time to book a cruise. It started about 5 p.m. yesterday. Still coming down at noon. 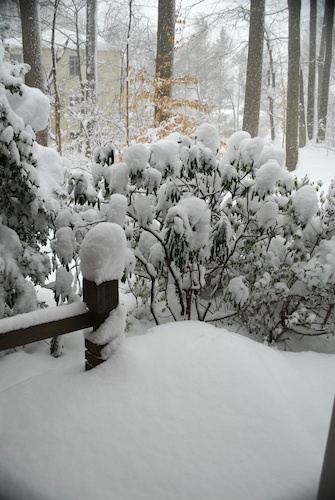 This is our back deck. 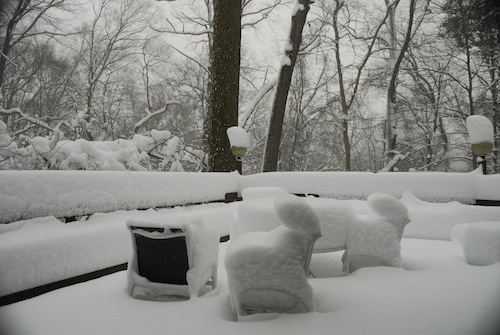 Our estimate: at least 20" on the patio table. 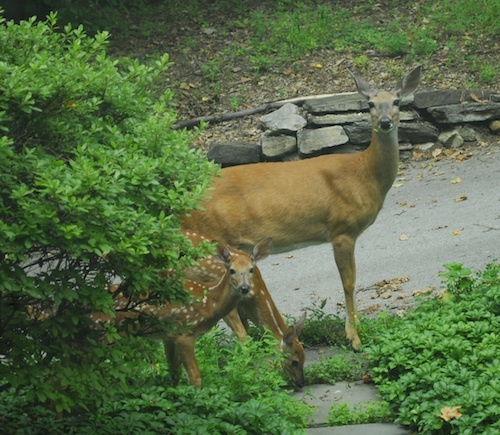 Open the front door and this is what you see. Looking out the front window. Our poor little cars. 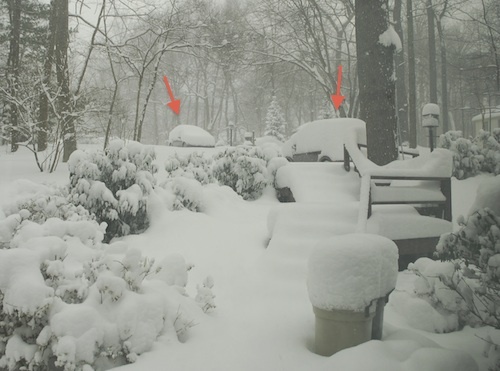 But at least we have learned to move our cars up toward the top of the driveway (near the street) when snow is predicted. iTunes is currently playing: Speak Like A Child from the album The Singular Adventures Of The Style Council by The Style Council. 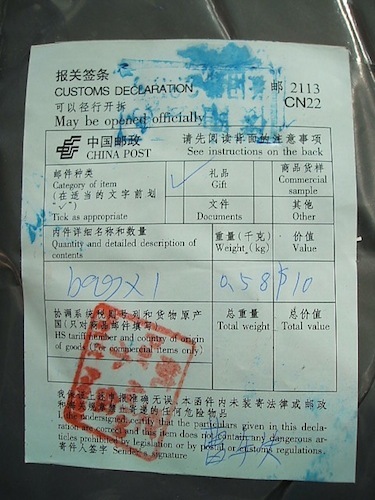 ... receiving packages from China. Chinese characters are so beautiful. They remind me of snowflakes. Do you think that the characters circled in pink mean "United States"? 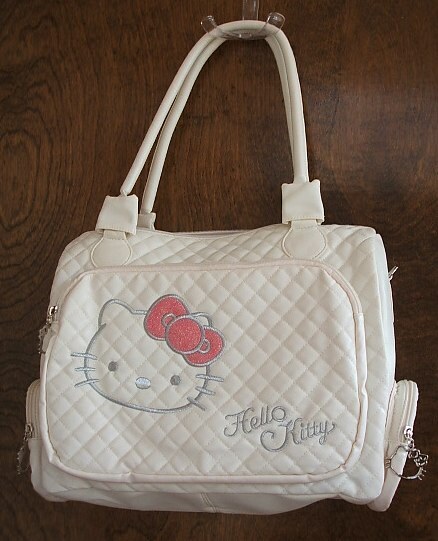 I also love Hello Kitty. And I love the bag I got from Hannah in China. Very reasonable. Very well made. Perfect handbag for traveling. iTunes is currently playing: Visions Of China from the album Live in Tokyo December 1982 by Japan. Call the Nestle Crunch Hotline at 800-295-0051. When you are asked if you want to continue in English or Spanish, just wait quietly for about 10 seconds and you will smile. Promise! Keep going and press 4. Listen to the options and then press 7. If you aren't smiling by now, check and make sure you still have a pulse. iTunes is currently playing: Candy Everybody Wants from the album MTV Unplugged by 10,000 Maniacs.